You are currently browsing the tag archive for the ‘structure’ tag. Let be a measure-preserving system – a probability space equipped with a measure-preserving translation (which for simplicity of discussion we shall assume to be invertible). We will informally think of two points in this space as being “close” if for some that is not too large; this allows one to distinguish between “local” structure at a point (in which one only looks at nearby points for moderately large ) and “global” structure (in which one looks at the entire space ). The local/global distinction is also known as the time-averaged/space-averaged distinction in ergodic theory. A measure-preserving system is said to be ergodic if all the invariant sets are either zero measure or full measure. An equivalent form of this statement is that any measurable function which is locally essentially constant in the sense that for -almost every , is necessarily globally essentially constant in the sense that there is a constant such that for -almost every . A basic consequence of ergodicity is the mean ergodic theorem: if , then the averages converge in norm to the mean . (The mean ergodic theorem also applies to other spaces with , though it is usually proven first in the Hilbert space .) Informally: in ergodic systems, time averages are asymptotically equal to space averages. Specialising to the case of indicator functions, this implies in particular that converges to for any measurable set . for some . Then there exists a constant such that for in a set of measure at least . Informally: if is locally constant on pairs at least of the time, then is globally constant at least of the time. Of course the claim fails if the ergodicity hypothesis is dropped, as one can simply take to be an invariant function that is not essentially constant, such as the indicator function of an invariant set of intermediate measure. This corollary can be viewed as a manifestation of the general principle that ergodic systems have the same “global” (or “space-averaged”) behaviour as “local” (or “time-averaged”) behaviour, in contrast to non-ergodic systems in which local properties do not automatically transfer over to their global counterparts. for all additive quadruples in , by which we mean that and . The two notions are closely related; it is easy to verify that is an affine homomorphism if and only if is the sum of a homomorphism and a constant. “Trivial” examples of quasimorphisms include the sum of a homomorphism and a bounded function. Are there others? In some cases, the answer is no. For instance, suppose we have a quasimorphism . Iterating (2), we see that for any integer and natural number , which we can rewrite as for non-zero . Also, is Lipschitz. Sending , we can verify that is a Cauchy sequence as and thus tends to some limit ; we have for , hence for positive , and then one can use (2) one last time to obtain for all . Thus is the sum of the homomorphism and a bounded sequence. Such functions are called -coboundaries. It is easy to see that the abelian group of -coboundaries is a subgroup of the abelian group of -cocycles. The quotient of these two groups is the first group cohomology of with coefficients in , and is denoted . If a -cocycle is bounded then its derivative is a bounded -coboundary. The quotient of the group of bounded -cocycles by the derivatives of bounded -cocycles is called the bounded first group cohomology of with coefficients in , and is denoted . There is an obvious homomorphism from to , formed by taking a coset of the space of derivatives of bounded -cocycles, and enlarging it to a coset of the space of -coboundaries. By chasing all the definitions, we see that all quasimorphism from to are the sum of a homomorphism and a bounded function if and only if this homomorphism is injective; in fact the quotient of the space of quasimorphisms by the sum of homomorphisms and bounded functions is isomorphic to the kernel of . Presumably the constants and can be improved further, but we have not attempted to optimise these constants. We chose as the domain on which one has a bounded derivative, as one can use the Bogulybov lemma (see e.g, Proposition 4.39 of my book with Van Vu) to find a large Bohr set inside . In applications, the set need not have bounded size, or even bounded doubling; for instance, in the inverse theory over a small finite fields , one would be interested in the situation where is the group of matrices with coefficients in (for some large , and being the subset consisting of those matrices of rank bounded by some bound . for all . Note we may assume without loss of generality that and . Then from (11) we have (4). For we have , and (5) then follows from (9). 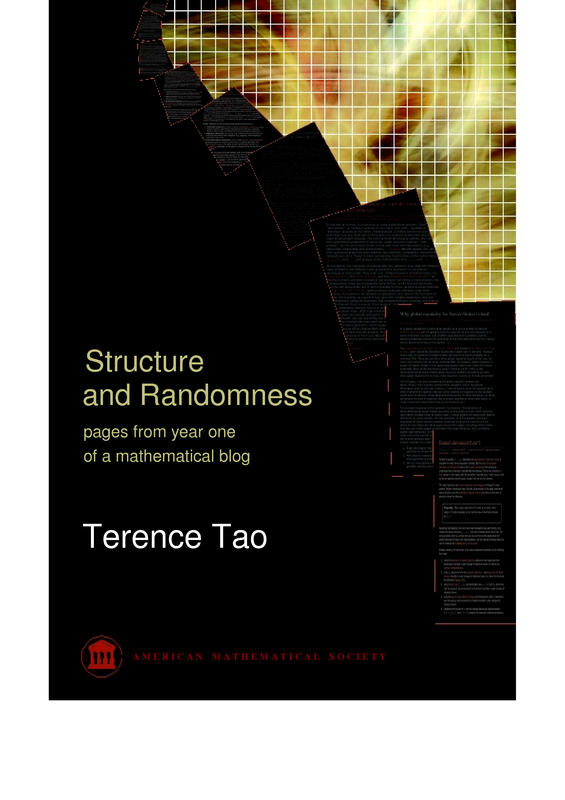 The AMS has just notified me that the book version of the first year of my blog, now retitled “Structure and Randomness: pages from year one of a mathematical blog“, is now available. An official web page for this book has also been set up here, though it is fairly empty at present. A (2MB) high-resolution PDF file of the cover can be found here. I plan to start on converting this year’s blog posts to book form in January, and hopefully the process should be a little faster this time. Given that my lecture notes on ergodic theory and on the Poincaré conjecture will form the bulk of that book, I have chosen the working title for that book to be “Poincaré’s legacies: pages from year two of a mathematical blog“.